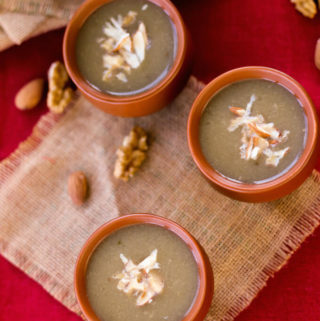 Bajra Raab is a special winter drink made in Rajasthan and Gujarat. And even though I lived more than half my life in Rajasthan and Gujarat, I had bajre ki raab for the first time just last month in a cousin’s wedding! Bajra or pearl millet flour is widely used during winter months as it very nourishing and healing. Raab is a very thin drink made with different millet flours and if you boil it for long, it can be made thick like pearl millet porridge. 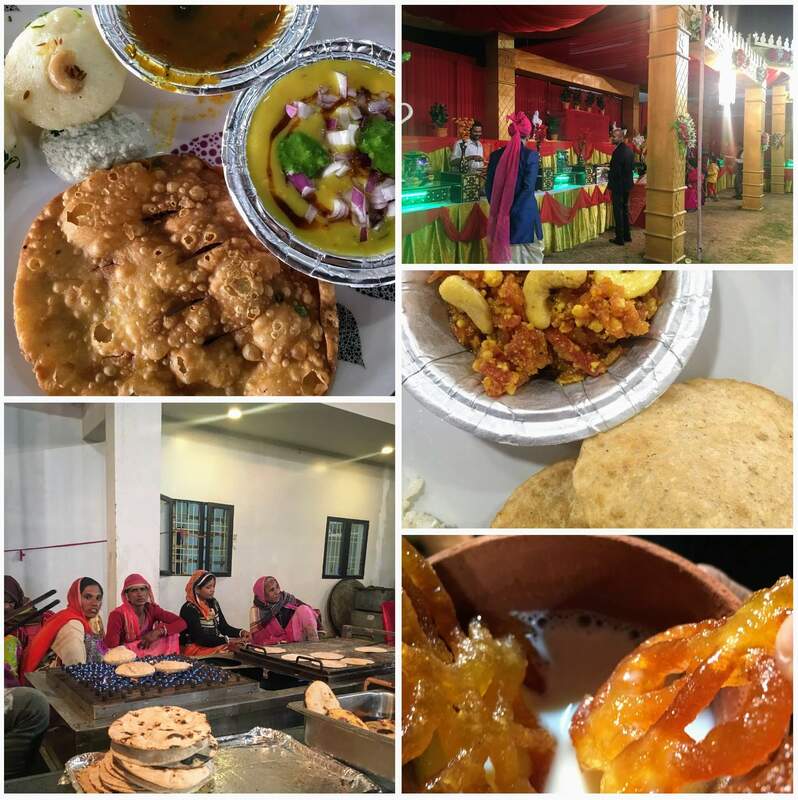 Rajasthani weddings are quite heavy on food and this wedding was in Kishangarh, a very small town in the outskirts of Jaipur and known for its traditional Rajasthani food. All 4 days we feasted on winter desserts like moong dal halwa, carrot halwa, and doodh-jalebi. Some of the food we feasted on during the wedding! On the wedding night the menu had some very special Rajasthani specialities. I knew of corn tikkad but raab was new for me. I didn’t even think we could make a drink out of pearl millet flour or any flour for that matter. Till now I have only used it to make bread. So I was very intrigued. I loved it at first sip. Sweet, salty, warm, earthy, comforting… I can run out of adjectives to describe this drink. Traditional recipes from the villages of India! I asked one of ladies how it was made and the raab recipe couldn’t be more simpler. Just roast bajra flour is some ghee and ajwain seeds, add jaggery, ginger powder and a pinch of salt, add water and let it boil. She told me in the villages raab is a common drink during winter months as it builds your immunity. It is also given to pregnant and nursing mothers as bajra is very nutritious for them. 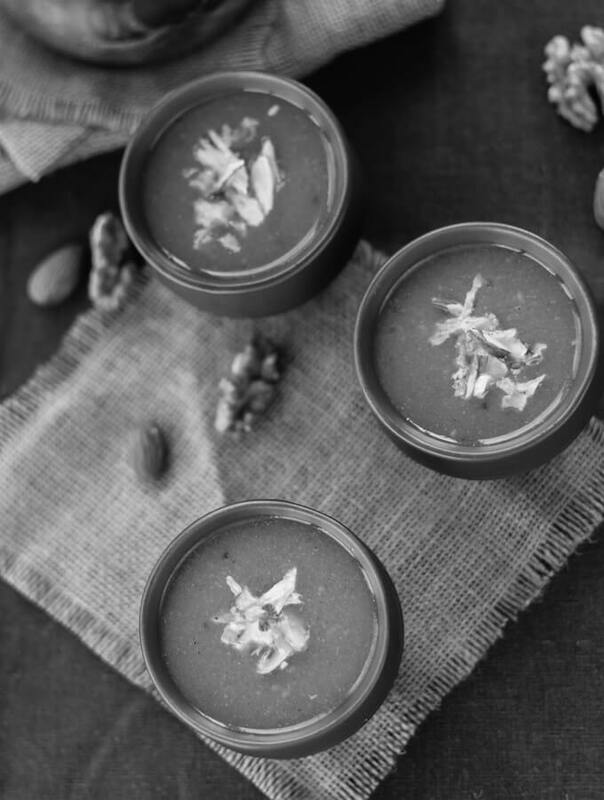 Every ingredient in the recipe is healthy and perfect to build your immunity against or fight common cold, coughs, fever and other winter spoilers! Back in Bucharest, now that the temperature has started going downwards to lower than -5ºC, this simple pearl millet drink is our go to drink if we are feeling a little under the weather. One glass and you feel all the energy coming back. Raab can also be made with other millets like corn and ragi (finger millet). I am yet to try them but they surely are on my list. If you like this recipe, please do rate it below and/ or leave your thoughts after the recipe. 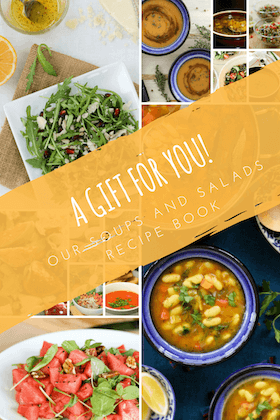 It will really encourage me to continue improving and exploring new recipes! 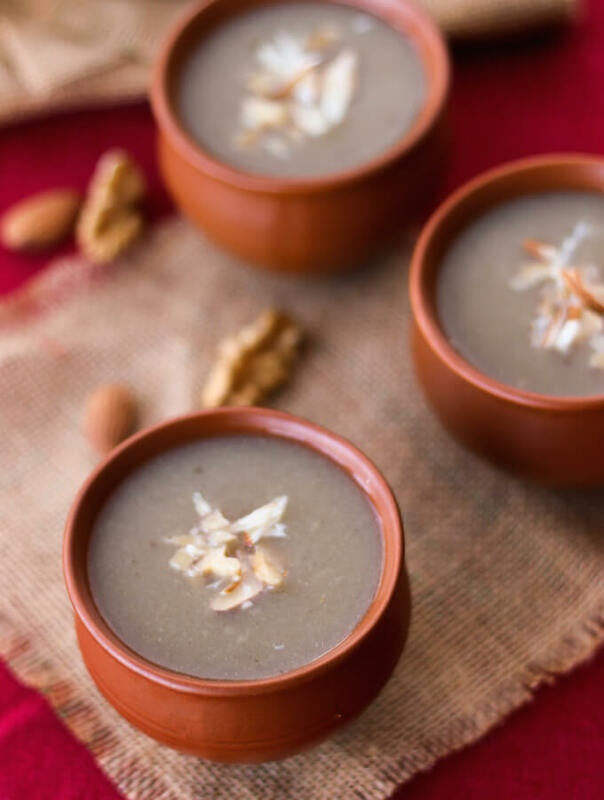 Nutritious and delicious, Bajra raab is a popular winter drink made with pearl millet flour. It builds immunity and heals your body from common winter ailments. Just 15 mins and less than 10 ingredients. Once the ghee is hot, add ajwain seeds and watch them sputter. Add bajra flour (pearl millet flour) and roast it in ghee for 2-3 mins. You will start to smell the aroma of bajra roasting in ghee. Add the jaggery, salt, ginger powder and water. Mix very very well to ensure that there are no millet flour lumps and the jaggery is completely dissolved in water. Bring it to a boil and continue to cook on low heat for another 5 mins. The raab is ready. Empty into serving glasses and add some chopped nuts (I used almonds and walnuts) on tops. Serve hot. Millets are naturally gluten-free and a great alternative to wheat. I have also only recently started exploring millets and I’ve felt so much improvement in my general wellbeing when I eat more of millets and less of wheat. Here are some more millet recipes that you can look at. Hi Ashima, Thanks for posting this. My kind of recipe. Make something similar with nachni/ragi flour. Will try it out with bajra flour too. Like you said healthy, nutritious, and a lot easier to digest. Of late, have been trying to replace my afternoon tea with these kind of drinks. I need to post the recipe for Ragi malt too! I first had it when a friend made it for a infant. She was 8 months then and my friend was so happy that her daughter loved the ragi malt. I tasted and fell in love with it myself :-). Good move on replacing your afternoon tea.. I am sure it is doing you a lot of good! Thanks so much for sharing your thoughts. All this interaction really encourages me to keep exploring and sharing! Hey Ashima, tks recipe.. I too tasted raab at a friend’s ancestral home In rajasthan. Returned & experimented till I got the recipe the way I liked it. I roast bajra flour & store in air tight containers. Being in Bangalore we get SROUTED & roasted Ragi flour which I use regularly too. I add 2 spoons roasted flour to a few spoons of curds, pinch of salt & top with water. My daughter prefers the malt in milk with jaggery or sugar. Keeping the flour roasted is great prep tip. Thank you again!